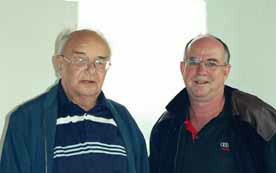 When Kevin and Del Zwar visited the Zwahr relatives in Saxony in 1984 the relatives were not aware that their ancestors had lived in Drehsa. So they visited Drehsa and showed the locals the original photo from 1905. 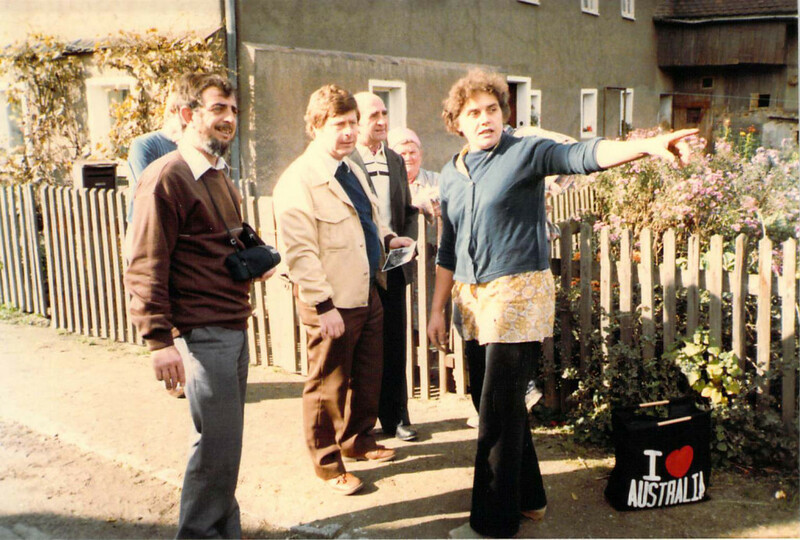 A search by a number of folk [Include From Left: Kevin Zwar, A Councillor, Ernst Zwahr and two local women] led to an old woman who remembered the house when she was a child, not long before it was demolished. The Zwahr house was demolished early in the 1900’s, a few years after this photo was taken. The house in the background belonged to J C Hempel who also went to Australia, and the next house [not shown] belonged to Regmann, who also went to Australia. 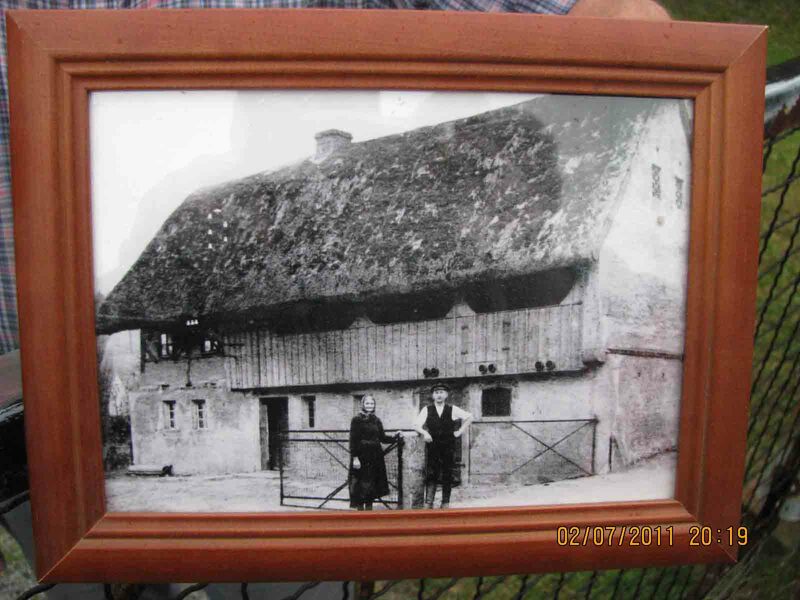 In 2011 Eric and Jean Zwar of Queensland visited Drehsa in Saxony and they were shown a photo of a house which had once been a Zwahr home. We don’t know who might have lived in this house? Drehsa village on a map of local villages and towns. Some of our Zwar ancestors who lived at Drehsa attended the school at Wurschen, a village less than two kilometres northeast of Drehsa. The school served other nearby villages too. In later years Wends in Australia from this District knew each other well as they had all attended the same school as children at Wurschen. The original school lies outside the village and includes a lake surrounded by trees. The lake contains some varieties of fish. In Germany these small lakes are called ‘fishponds’, and they are numerous in the Wend area. I think we would call them ‘small lakes’ in the English speaking world as they can cover a few acres of land. The school building and land originally belonged to a fisherman and was his home. The building and property were then bought and donated to the community as a school by a wealthy donor. The teacher lived in one end of the ‘house’, and the students attended school in the other half. The original school building is now a private house. We were given a warm welcome by the owner when we called in 1994. The first officially registered government school in Wurschen only opened here in 1826, though there had been an unofficial school operating in Wurschen prior to this time. School records show Peter Zwar started school in 1831, his sister Maria Zwar in 1834, brother Michael Zwar in 1836, and their youngest brother Karl Zwar in 1842. […from Walter Dittrich]. [The two older brothers Andreas and Johann may have attended the earlier unofficial school, but we have no evidence for this.] This building served as the school until the 1870’s when a new school was opened in the actual village of Wurschen. Please note: If you go to the present school in Wurschen and ask about the ‘original old school’ you might be shown the old building on the same property as the present school. This old school opened in the 1870’s and stands on the school property near the current modern school in the village. Many of the locals are not aware of the original registered school by the lake that our Zwar ancestors attended. The Zwahr family were members of the Lutheran Church in Gröditz in the Kingdom of Saxony. The large Church stands on top of a hill in the village of Gröditz and the steeple can be seen from the top of the Wendish tower in Bautzen, 13 kilometres away. About 400 people live in the town of Gröditz today. 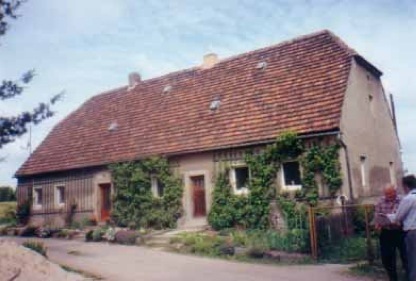 It is traditional in this area of Saxony for one church to serve a number of villages. 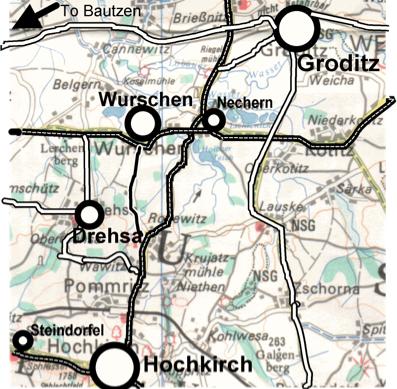 The Gröditz parish takes in 11 villages, including Drehsa where the Zwahr family lived, about five kilometres in a direct line from Gröditz. 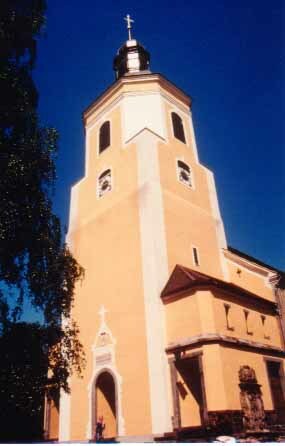 The Gröditz Church dates back about 800 years, and has gone through many changes over the centuries. The most recent huge change to the building was made a century ago; about 50 years after the three Zwar brothers emigrated to Australia. 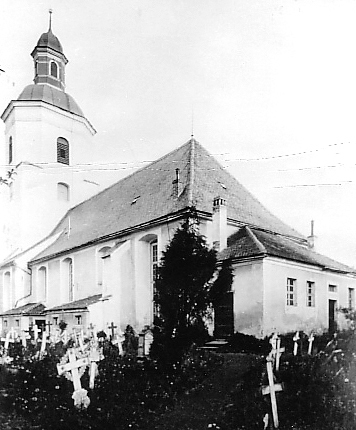 We have photos of the Church as it was in the days when the Zwar brothers worshipped there. In 1902 a much larger Church was built, but retained the huge stone tower. The new nave was built over the old Church so services could continue in the old building during construction of the new one! Then the old church was removed. The Church we see today retains the huge tower of old, but the main body of the Church has replaced the one the Zwahr family worshipped in during the first half of the 19th century. 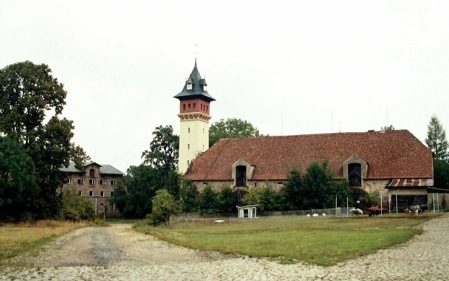 “The earliest documented record of the church and site of Gröditz is in 1222. At that time Gröditz was a small Wendish village with a rampart, commonly called an entrenchment, which is still well preserved today (in the garden of the former castle and today a psychiatric hospital). The Slavic layout of these fortifications gave the town its name. 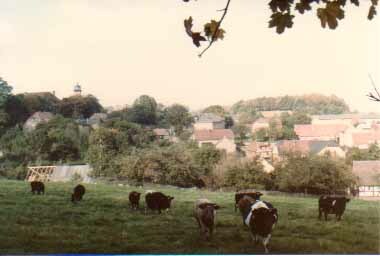 In Wendish the rampart is called “hrodzisco” (earlier “grodiste”), and that is how Gröditz got its name. Of the first church, built in Roman style, only the main entrance remains. Today it is found on the southern side and is the entrance to the vestry. Especially valuable is the head of the pillar, an amazing achievement for the stone masonry of the time. The church tower was only built about 100 years later (in Gothic style). Today it is the heavy square lower part of the tower. The church was converted to the Renaissance style after the 30 years war. The candlesticks on the altar, the baptism bowl as well as the altar picture in the community hall date from this time. In the 18th century the tower was given an octagonal top (Baroque) which made our church building the beautiful feature of the countryside that it still is today. Soon afterwards the church was enlarged and converted to the Classical style. In appearance it resembles very much the neighbouring church in Beruth that retains this shape still today. 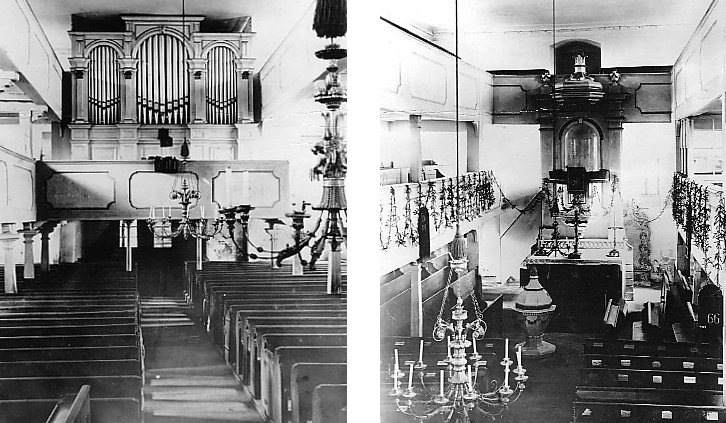 The stone font and the Eule pipe organ installed in 1878 come from this church. The whole nave was pulled down and renewed in 1902. People built to meet the perceived demands of the church people of that time and planned on a very large scale (with seating for 850). Just about all the furnishings were also created at the beginning of our century. Therefore our church does not hold a lot of interest for the cultural historians, although increasingly the worth of the sound work of carpenters and artists is being recognized. Our church, however, has a greater task than only to be a witness to the artistic and handcrafting abilities of our ancestors. It wants to point to the Lord of the Church, Jesus Christ. This is the meaning of the word “Church”. It stems from the Greek and means “Belonging to the Lord”. The following information comes from a history typed out on two sheets of paper and displayed at the church in Gröditz in the German language. Kevin Zwar photographed the 2 sheets in 1984. Mrs. Chris Greenthaner kindly completed the following translation into English in 1992. “The interior of the church is a structural/architectural confession of the faith. The floor plan is in the shape of the cross † and refers to the death of Jesus by crucifixion. As in just about every church, the sanctuary is placed on the eastern end. This is a reference to Israel, the homeland of Jesus in the East. The initial Greek letters for “CHRist” (X and P) are interwoven. A and W are the first and last letters of the Greek alphabet. is inscribed on the archway in two languages to reflect the German / Wendish character of the congregation. and the floor of the sanctuary is the earth. The left window depicts the Christmas story: the birth of Jesus. “Suffered under Pontius Pilate, was crucified, dead and buried …” A figure of the risen Christ with the victory banner is pictured on the peak of the altar. The right window depicts the festival of Pentecost. The Holy Spirit comes on the despondent disciples (in flames above their heads) and inspires them to spread the Christian faith. The community of believers, the Church, exists since Pentecost. Translated by Chris Greenthaner from the German original. The first mention of the village of Drosaw in records is 1439. Prior to that a ‘Hinczinne from Drossaw’ is mentioned in a mortgage book in Bautzen in 1425. The origins of the name probably go back to a personal name, Droz. 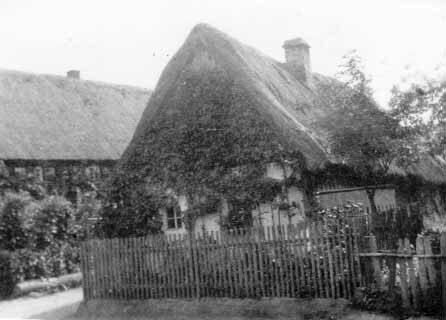 The resultant feudal estate is indicated as a manor in 1624, and simply as the Farm Drehsaw in 1658. South of Drehsa there is a rich burial ground found in the forest dating from the iron age. Clearly the area is of Wendish origins. In 1810 the manor had at its disposal 4 draught horses, 6 oxen, 20 cows, one calf, 200 sheep and two pigs. The community comprised 26 farm worker families, two millers, one publican, blacksmith and carpenter and seven day labourers. Altogether these had 9 draught horses, seven oxen, 73 cows and 5 calves to show. There are no longer any existing references to the so-called ‘old castle’ southeast of the northern part of the Estate. It is possible that a 5 metre wide and 2 metre high knoll could stem from the supposed section of a rampart from the Slavic era. In 1847 a banker from Berlin purchased the Drehsaer Estate, and later on it served as the Summer retreat of a different banker who also had a park laid out [established.]. The Park displays a rich world of songbirds. Hedge sparrows, mockingbirds and robin redbreasts are prominent in the shrubs, as are wood pigeons and golden orioles in the trees. In 1903 the princess of Hanau took over the Estate. Sandstone figures and statues from Wagnerian operas were transferred to this park from her previous possession, the palace Horovice in Bohemia. Statues of Brunhilde and Siegfried can still be seen there today. The castle underwent restoration in 1911. 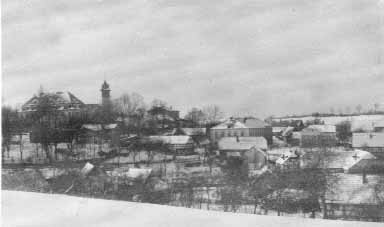 From 1925-1934 the estates economy served the agricultural experimental station of Prommritz. After 1945 the manor was resettled and comprised eight new farms. The castle was used for various social purposes over time. 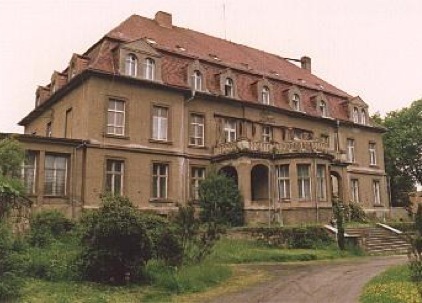 Presently it is used as the Lieselotte Herrmann Childrens’ Home under the direction of the Bautzen District Council. It accommodates children who are assigned by the youth support organizations. As well as this there is also a permanent child care centre for children. The town numbers 460, a part are Wendish residents. Out of all the examples of the old style of village building, the two story dwelling No. 17 is placed under heritage classification. Its ground floor shows surroundings which are supporting columns of decorated gutterings (?). The gables displays arched friezes on its planking, and the tiled roof of the rich 100 year old building is domed. The now unused blacksmiths shop belongs to the site, with its half timbered upper story which rests on two brick columns. … The number of Wendish field names is considerable. Mostly they give the position of various parts of the land: Dolki = ‘small valley’. W žlobach = ‘in the gully’. On the way to Horschau a rectangular column stands made from Lamprophyr-roughly hewn, squat with a carved [Radkreuz] rimmed crucifix (??) – of great age and uncertain meaning. (C) Translated by Chris Greenthaner from the German original. 1474 Drassow appears in an old history of Bautzen: Heinrich Ernst v. Gersdorff received the Estate of Drassow from his father, Christian v. Gersdorff. 1627 His brother, Christoph Volkmar v. Gersdorff is feoffed with Drehsa. 1658 The description ” Drehsa Farmstead ” is found. 1661 Bought by Christian Gottlob v. Metzradt. 1691 Inherited by his son, Caspar Rudolf v. Metzradt. 1729 Inherited in turn by his son, Christian v. M.
1752 Drehsa falls to his son, Caspar Rudolf Gottlob v. M.
1764 Sells it to his wife, Henriette Friederike v. Metzradt nee v. Ziegler and Klippenhausen. 1788 She dies, and the manor is returned to Caspar Rudolf Gottlob v. M.
1802 He sells it to his daughter-in-law, Auguste Friederike Elisabeth v. Metzradt, nee Rothe. 1826 Her son, Ernst Caspar v. Metzradt inherits the manor, termed Rittergut from 1810. 1869 His son, Rudolf Martin, Baron v. Magnus, inherits 4/5 of the estate. 1879 His son, Conrad Martin, Baron v. Magnus, in his turn inherits the manor. 1889 Drehsa becomes the family property of the Berlin banker, Baron Dr. Julius v. Bleichröder. 1903 The princess Hanau took over the manor. 1945 Drehsa Castle becomes the Soviet command centre. 1958 Establishment of a combined childrens’ institution by a Berlin-based department of the NVA. 1959 Takeover of the childrens’ institution by the Council for the District of Bautzen, as a normal childrens’ home and childrens’ creche. After his wife Magdalena Rentsch (of Drehsa) died, Peter Zieschank (Kreckwitz) migrated from Australia to Texas and abandoned a humble place. (?) [“und liess sich im Ort Nook nieder”]. Johann Christoph Hempel lived in Drehsa, next door to the Zwahr family, but he was possibly born elsewhere. He was 56 years old when naturalised in New South Wales, Australia 8th Nov. 1850. 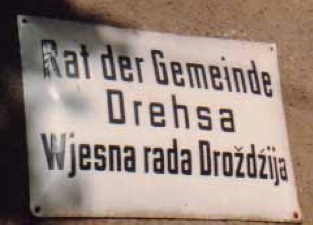 The Regmann family lived in Drehsa before going to Australia, and may have been born in Drehsa.